"Are you passionate about baking? Do you love the holidays? Then this is the show for you! 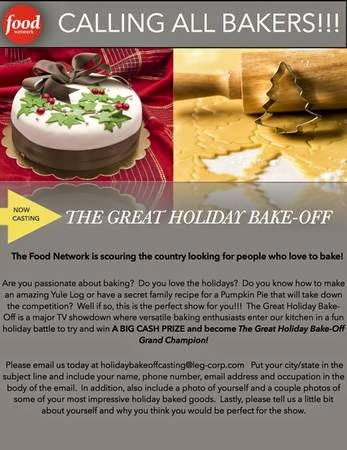 The Great Holiday Bake-Off is a major TV showdown where versatile baking enthusiasts enter our kitchen in a fun holiday battle to try and win A BIG CASH PRIZE! Please email us today at [email protected] Put your city/state in the subject line and include your name, phone number and occupation in the body of the email. Include a photo of yourself and photos of some of your most impressive holiday baked goods. Lastly, please tell us a little bit about yourself and why you think you would be perfect for the show." With the name being The Great Holiday Bake-Off, and the fact that they are just casting now, look for the show to air late in the year around the holidays. It remains to be seen who will host and how much the prize will be. Also, look for more of the new Food Network shows for 2014 to be revealed soon during the Scripps Upfront presentations. This reminds me of how much I hope CBS brings back the Great American Baking Competition.